This Introduction to Restorative Practices and Interventions training is designed for school staff who want to understand the basic principles, values and processes of restorative practices and interventions in school settings. Participants will come away with a thorough introduction to restorative justice, restorative discipline, and how the language, skills and processes fit into a school’s overall mission of creating caring climates based on respect, responsibility, and repair of harm. Participants will truly learn the difference between restorative and retributive (or punitive) justice. We will use a variety of teaching tools to keep you engaged including short presentations, real life stories, small group work, dyads, video and large group discussions. Our goal is to keep the pace of the day moving and full of variety. This training is ideal for teachers and administrators who want a basic introduction to the principles and language of restorative justice as it is applied in schools so that you can carry these into your classrooms and offices. Each participant will come away with a small packet of materials. This training is designed for the “core team” for a school’s restorative discipline/practices efforts. We will cover the basic principles, values and processes of restorative practices and interventions in school settings along with the key elements of implementation, assessment and evaluation, and follow up. Participants will come away with a thorough introduction to restorative justice, restorative discipline, and how the language, skills and processes fit into a school’s overall mission of creating caring climates based on respect, responsibility, and repair of harm. In addition, participants will come away with a specific plan of action for their school. We will use a variety of teaching tools to keep you engaged including short presentations, real life stories, small group work, dyads, video and large group discussions. Our goal is to keep the pace of the day moving and full of variety. This training is ideal for teachers and administrators who want a basic introduction to the principles and language of restorative justice as it is applied in schools so that you can carry these into your classrooms and offices. Each participant will come away with a small packet of materials and a copy of “The Little Book of Restorative Discipline for Schools“. This training is designed for classroom teachers who are interested in implementing specific classroom strategies using restorative principles and practices. Following an introductory training in the basic principles, values and processes of restorative practices and interventions in school settings, we will discuss and practice ways that classroom teachers can implement restorative values and practices, such as connection circles, using affective statements, restorative conversations, restorative agreement meetings and curriculum integration strategies, in their specific classrooms. Participants will come away with a specific plan of action for their classroom and their school. We will use a variety of teaching tools to keep you engaged including short presentations, real life stories, small group work, dyads, video and large group discussions. Our goal is to keep the pace of the day moving and full of variety. This training is ideal for teachers who want to learn how to use restorative practices and restorative discipline with their students. Each participant will come away with a small packet of materials. This training is designed for staff and or students who want to use the basic principles, values and processes of restorative practices and interventions in school settings with an emphasis on restorative conferencing and mediation. Participants will come away with a thorough understanding of restorative justice and restorative discipline and how these skills and processes fit into a school’s overall mission of creating caring climates based on respect, responsibility, and repair of harm. While we will use a variety of teaching tools to keep you engaged including short presentations, real life stories, small group work, dyads, video and large group discussions, much of our focus will be on demonstrating and practicing the process of restorative conferencing and mediation. This training is highly participatory and will involve role playing as a significant part of the learning process. Again, our goal is to keep the pace of the day moving and full of variety. 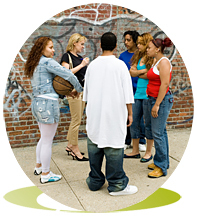 This training is ideal for program coordinators, teachers, students, counselors, deans, assistant principals, and administrators who want to learn and practice the principles of restorative conferencing and mediation to handle everyday disputes, wrongdoing and serious harm. Each participant will come away with a restorative justice and conflict mediation training manual.